This is probably the most provocative as well as evocative sentence (p. 107) in Leonard Allen’s new book entitled Poured Out: The Spirit of God Empowering the Mission of God (ACU Press, 2018). The mission of God (missio Dei) involves a “double sending—two missions: the mission of the Spirit and the mission of the Son.” One is incomplete without the other. Allen suggests the “mission of the Son,” who is the “central content of the gospel,” becomes “operative and effective through the mission of the Spirit,” which empowers the ministry of the church, gives the church the experience of divine life, and forms the church into the image of Christ (p. 108). While the Father is the source of life, and the Son is the model of life, the Spirit is the one who brings life “so that we actually experience it” (p. 70). Consequently, “the missions of the Son and of the Spirit are equal, each according to its distinct function” (p. 108), as both the Son and the Spirit are sent by the Father into the world to accomplish the divine mission (which includes the functions of both the Son and the Spirit). Allen’s book seeks to restore the place of the Holy Spirit in the church’s theology of Trinity, mission, and formation. While there are significant and rather comprehensive discussions of the latter and the former, the heart of the book is the relationship between Spirit and mission. I have developed a three-part thesis: (1) with the receding of (neo-) Christendom, a strong new focus on the mission of God has been emerging; (2) at the same time an unprecedented focus on the Holy Spirit has also emerged [especially in the Global South, JMH]; and (3) the renewal of mission and the Holy Spirit go hand in hand. This conjunction means that every Christian is a missionary in our new post-Christian context (particularly in the West), and it means that every Christian is a charismatic, that is, indwelt and gifted by the Spirit for mission. I highly recommend this book for study in small groups, congregational classes, and personal reflection as well as a guide for a homiletic foray into a congregational focus on the Holy Spirit in the assembly’s worship and learning of God. To my mind, this is the most significant book to appear on the Holy Spirit among Churches of Christ since Robert Richardson’s 1873 A Scriptural View of the Office of the Holy Spirit. Review of Jacob Arminius: Theologian of Grace, by Keith D. Stanglin and Thomas H. McCall. New York: Oxford University Press, 2012. This review first appeared in Restoration Quarterly 56 (2014): 258-259. This book is long overdue. While the shelves are filled with scholarly summaries of Augustine, Luther, Calvin, and Wesley, this is the first book-length rigorous exposition of the theology of Arminius. MCall and Stanglin intend their work as a complement to the magisterial 1971 Arminius biography by Carl Bangs. They write within the framework of a renaissance of Arminius scholarship (whaich began in the 1980s) that is more objective (as opposed to polemical) and contextual (recognizing a Reformed scholastic setting) than previous studies that heralded him as either saint or sinner. The subtitle reflects their specific intent. They explain Arminius’s theology of grace in the light of the topics that most consumed his attention in the first decade of the seventeenth century and what “recent scholarship has found to be central.” Through a “constructive synthesis,” McCall and Stanglin “attempt to show what “makes him tick” (21). Grace is a pevasive theme that drive his pastoral and theological interests. This stands in contrast with some interpreters who think Arminius subverted the Reformed understanding of grace by “elevating autonomous human free will and introducing anthropocentrism into Protestantism” (22). On the contrary, Arminius consistently maintained the necessity and sufficiency of grace. While developing his perspectives within the heart of the Reformed faith, the authors argue that Arminius had a “different theological starting point” from that of his opponents. Arminius begins with a theology of creation whose central feature is a love for the creation as well as a love for righteousness (God’s faithfulness to God’s own self). Out of this dual commitment, God “free–not of necessity–obliged himself to creation and set limits for his own actions” (93). The drama of redemption, then, is driven by God’s love for creatures coordinated with God’s own sense of justice. Arminius’s understanding of predestination, sin, and salvation arise from this fundamental theological orientation. McCall and Stanglin place Arminius in the trajectory of Irenaeus, the Eastern Orthodox, Aquinas (Jesuit interpretation), and Molina (whose “middle knowledge” he adopts) in contrast with the line that begins with Augustine, continues through Aquinas (Dominican interpretation), and finds expression in Calvin. The authors have succeeded. Their work will become a standard resource for the theology of Arminius in the foreseeable future, just as Bang’s biography has been for over forty years. Historical theologians, students of Arminianism and Calvinism, and those engaged in contemporary discussions of neo-puritanism (the young, Reformed, and restless) owe to themselves as well as to fair sense of history to digest this book carefully. Several weeks ago, Michael Shank asked—by email—if I would review his new book, When Shovels Break, on my blog. Since I reviewed his first book Muscle and a Shovel, I thought it brotherly to say “Yes” to his request, just as I have responded to all his communication with me in the wake of my review of his first book. In his new book, Michael continues the narrative of his life story after his baptism. We follow him through several moves, jobs, and diverse circumstances. Michael tells how he lost his way—spiritually, emotionally, physically, and ethically. I will leave those details to his confessions within the book. Readers will discover them, and I do not need to rehearse them here. What is important about such a confession is how Shank uses his own story to tell a story of restoration and renewal, to offer an example of how one deeply entrenched in their own despair might yet return with joy and experience God’s grace. The book is intended for those who, like him, had left the faith and find it difficult—if not impossible—to return. In essence, just as he offered a plan of salvation for “alien sinners” in his first book, so here he offers a “plan for spiritual success in this life which will lead to our ultimate spiritual success—eternal life” (pp. 367-8). It is a “prevention” plan, which is the “power of God’s instructions” (p. 364). This “plan” (or “program, a blueprint, a syllabus, a game-plan, a living strategy” or “call it whatever you like”) provides a means for securing one’s calling and election based on 2 Peter 1:5-9. This is a “success” book–a how-to-return-and-prevent-losing eternal life, and it is offered in several steps. This book, in the way Shank frames it, is for those who want success. Shanks suggests if we remember how God has purged us from sin and pursue the virtues Peter lists, we will walk a path of “success” spiritually, even if there are hard knocks along the way. His last seven chapters are the seven virtues: virtue, knowledge, temperance, patience, goodness, brotherly kindness, and love. Indeed, the call to pursue these virtues is a welcome one, and it does provide a kind of “prevention” strategy. The book is not only concerned with prevention. It is primarily an invitation for those who have left God to return to God (pp. 223, 364, 282, 302, 348, 416, 421). Everyone can appreciate the value of such an invitation. On this point I have significant appreciation for some of the topics he addressed, and he addressed them out of his own experience. They appear in his five steps for “coming back to God”—yes, just as in the plan of salvation for “alien sinners,” there are also five steps in coming back to God. These steps are outlined in chapters 38-42, and to these steps God responds with “awesome love and grace” (p. 346, chapter 43). His five steps are essentially: (1) confess your sins and forgive yourself, (2) forgive others for their inattentiveness and gossip about your past, (3) pray and release your resentment against and disappointment with God, (4) recognize how God has used circumstances—even negative ones—to bring you back to God’s self, and (5) seek out friends to help in your return. These are helpful, especially self-forgiveness (see my post) and releasing our resentment against God (which I have called “forgiving God”). And just as the hypocrisy and gossip/slander of Christians often hinders others from returning to God, returnees must learn to forgive those who have mistreated them in their sin, whose hatred has hindered their return, and whose gossip has made it more difficult. These are good reminders. So, I have an appreciation for how Shank correlates his own experience, the experience of those he has interviewed, and the reality of the church in our American experience with the process of emotionally and spiritually returning to God in the midst of fallible and imperfect communities, that is, churches. Nevertheless, I do think the book is lacking in significant ways. Shank’s model is in danger of creating the kind of situation he rightly wants to avoid. He is concerned believers will become disappointed in God and despair over their circumstances, as he did himself. This is a legitimate concern, but the theology that drives Shank’s “plan” is one of self-reliance, that is, we have to work the plan, work it well, and only then will we succeed. That places tremendous pressure on the believer to achieve and perfect their lives rather than depending upon God’s empowering Spirit who works through us and in us as well as depending upon God’s gracious acceptance, even in our struggles. Of course, Shank believes God gives us all we need, but what we need is simply instruction rather than empowerment. In the end, it all depends on us working the plan, and then God’s “awesome grace and love” will be apparent. Second, the hermeneutical (interpretative) lens through which Shank reads the Bible is the same as that which produced his first book, and I critiqued that in my first review. The same proof-texting of Scripture emerges here, and the same assumptions about reading Scripture are present. I will offer one perspective to illustrate this. Interested readers can read the first review to see more examples. While rightly pointing out “the scriptures must remain in their intended context for the Truth to be found and understood properly” (p. 325) and “we must put effort into allowing the Bible to interpret itself (p. 326), he insists the “commands of God are easy to identify” and “no deep interpretation is needed” (p. 210). “The big things are easy to interpret” (p. 210). These “big things” are: one body, the church; one baptism in water; Lord’s Supper every first day of the week; and singing without mechanical instruments (p. 210). Essentially, these items do not need interpretation, or at least “deep interpretation” (though, if we remember the first book, they do need a lot of muscle and a shovel to dig out since they are not readily available to the superficial reader). Yet, it is exactly “interpretation” (hermeneutics) that is the key to reading Scripture well, and interpretation is necessary at every reading of Scripture. Shank insists no one has a right to “private interpretation,” by which he means a “personalized” or “individual” interpretation. If he means Scripture should be read in community, I agree. But he does not say that. Rather, he quotes 2 Peter 1:20-21 to support his claim (pp. 326-7), and this is proof-texting itself. Peter’s point is that Scripture does not arise out of a prophet’s own interpretation (that is, out of his own autonomous thinking)—it is not about reading Scripture but about the origin and production of Scripture. The problem, however, is discerning the “big things,” and Shank identifies these as church patterns (which are, strangely, the very ones Churches of Christ find unique to themselves in some sense—reading it through Shank’s eyes) rather than on the larger themes of mercy, justice, and humility. In the end, his legal hermeneutic is intended to defend church practices rather than encourage merciful, gracious, and humble living. Third, his ecclesiology (the way he thinks about church) emerges in the context of liberal vs. conservative ideology. He wants to eschew both liberalism and conservativism within the “brotherhood.” Shanks simply wants to be nothing more than a “New Testament Christian” (p. 211). He identifies the “liberal subset” with: wider fellowship than Churches of Christ, “some use mechanical instruments, some accept any previous baptism [the historic rebaptism controversy, JMH], some have this new ‘praise team’ thing….some of them disregard the Bible’s qualifications of an elder, and then there’s the whole DMR [Divorce-Marriage-Remarriage, JMH] situation” (p. 197). He identifies the “conservative subset” with “the non-institutional [particularly those who forbid treasury money for orphanages, JMH], the one-cuppers…” (p. 198). There are so “many factions that we lose count” (p. 199). Now, of course, Shank positions himself in the middle, “Biblical” ground among these questions. Liberals and Conservatives are extremes—in the former “every religious person is saved” and in the latter “almost no one is saved except the tiny group that meets together” (p. 199). Shank occupies the right ground because he has correctly and rightly understood the Bible whereas these others have not. Interestingly, Shank asks conservatives, “So why do our brethren feel as though they can make the kind of judgments they make on others in our brotherhood?” (p. 200). That is a good question. Perhaps Shank should answer it in regards to those whom he calls “liberals,” especially since both are “good-hearted, God-fearing people who have been baptized into Christ and who are sincerely trying their best to do what God wants them to do” (p. 209). It seems to me Shank might want to give the same grace to the “liberals” he offers to the “conservatives” in the previous quote. The difference for Shank, it appears, is something like this: he has collected the “commands of God” that are “easy to identify” and labeled them essentials since “the big things are easy to interpret” (p. 210). This ease is rooted more in his hermeneutical and ecclesiological presuppositions than the text of Scripture. He does not recognize his own interpretative moves and the “pattern” he imposes on the text. What we both need is a dose of humility and grace to the other in our interpretations as we each do our best to read Scripture well and live out our faith in the present with mercy, justice, and humility. Shank’s two books essentially provide a kind of 1950s theology of the church driven by a 1950s way of reading the Bible. His first book provides the “first law of pardon,” and his second book provides the “second law of pardon,” as those “laws” were typically described in Churches of Christ in the 1930s-1950s. With both, one is now fully instructed as to how to be “faithful to the church,” as his first book put it. May God have mercy on both of our feeble hermeneutical attempts, and may we both rest in the grace of Jesus our Lord whose awesome love abounds for us of all. The full review of Muscle and a Shovel by Michael Shanks is now available in a PDF file. Anyone may print and distribute this as they desire. The text is also available on Kindle. My longtime good friend, John King, is engaged in training people around the world in Discovery Bible Studies as part of the CityTeam Ministries’ Disciple Making Movement or the Church Planting Movement (specifically the work of David Watson). I love what he is doing with the support of his wife Debra. John recommended that I read Miraculous Movements: How Hundreds of Thousands of Muslims are Falling in Love with Jesus (Thomas Nelson, 2012) by Jerry Trousdale. Since John began telling me about his work I had wanted to read something substantial that tells the larger story. I am happy to report that this book does just that. Is it possible that 200,000 Muslims have become Christians in West Africa since 2007? Is it possible that 6000 new churches have been planted? Is it possible that 45 new people groups have been reached? This book tells that story which includes more than 350 different ministries cooperating in these efforts. It is not so much a history of that development as it is a story that narrates the church-planting or disciple-making method that facilitated such Spirit-generated fruit. That method involves saturating prayer, finding a “person of peace,” focusing on groups rather than individuals and utilizing the Discovery Bible Study method. Make Intercessory Prayer the Highest Priority (or, nothing is more important than prayer…period!). Make Disciples Who Make Disciples (or, invest time in discipling a few who will themselves disciple others). Invest Time in the Right Person (or, instead of mass marketing invest in a “person of peace” who will “bridge the gospel into that community”). Don’t Tell People What to Believe and Do (or, give space for the Spirit to work through the Word as people discover Christianity for themselves). Never Settle for Revealing Just One Dimension of Jesus’ Life (or, follow the model of Jesus’ own ministry who demonstrated compassion rather than merely disseminating information). Never Substitute Knowledge About God for an Obedience-Based Relationship with God (or, information is good but obedience is better). Understand that Jesus Does Impossible Things Through the Most Ordinary People (or, professional ministers are helpful but not necessary). This is not an academic book, and that is a good thing. Rather, Trousdale utilizes extensive oral reports from former Muslims and on-the-ground ministers who have seen and experienced this tremendous harvest. The stories from former Muslims are compelling. The book is filled with stories of answered prayer, courageous believers, Muslim conversions, dramatic transformations, and God’s faithfulness to his witnesses. Through these stories, we learn about Muslim dissatisfaction with their sense of assurance, their lack of knowledge about Jesus, the social pressure that hinders their own search, and the violence that follows converts. People are often martyred in Africa for their witness to Jesus. The witness present in this book is a sobering encouragement for believers who live in the comfort of the United States. It is also a report of what God is doing and in reading it we should all give thanks for God’s marvelous movement among Muslim people-groups in Africa. Reading these stories encourages us to look more simply at Christianity. Western modernism has complicated Christianity and academia has often subverted it. The movement of Christianity in West Africa among Muslims is simple, powerful and courageous. Meeting in small churches (an average of 32 disciples per congregation), these disciples are changing the landscape of West Africa by the power of God’s working among them. I must admit that my Western skepticism is high (some of the stories are way outside my comfortable box), but I also recognize Western skepticism is often antithetical to what God is actually doing. I too easily limit God for the sake of my own rational, emotional and self-righteous comfort. So, I’m listening and hoping to learn more. May God help my unbelief. 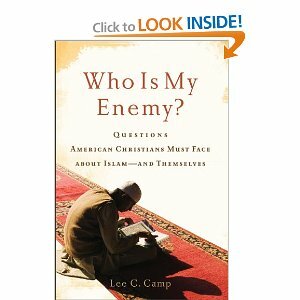 My dear friend, as well as colleague, Lee C. Camp has recently released a new book entitled: Who Is My Enemy? Questions American Christians Must Face About Islam–and Themselves. Lee is Professor of Theology and Ethics at Lipscomb University in Nashville (TN) where I also teach. Lee uses a line from a prayer of St. Francis of Assisi as a hermeneutical principle: “Grant that we may not so much seek…to be understood as to understand.” He focuses this principle in the light of Mirosalv Volf’s call for “double vision” in his book Exclusion and Embrace, that is, to look at any question from the other’s point of view, especially our enemies. To love our neighbors is to understand their point of view even if we might not agree with it. Consequently, Lee attempts to understand Islam’s presumed orientation to war-making, and at the same time compare it with the Just War tradition in the history of Christianity. The results are stimulating and disconcerting. The Jesus story, Lee claims, is nonviolent, and the leading theologians of the early church until the fourth century were also nonviolent. They opposed violence and war-making. Following his teacher and mentor John Howard Yoder, Lee suggests that a Jesus politic generates “a distinctive community that has its own particular, if sometimes peculiar, ways of life together” (p. 32). This community loves its enemies, seeks peace, rejects violence, and pursues justice. The Christian politic is a “politics of suffering, nonretaliatory love” (p. 37). Interestingly, Lee suggests that Muhammad initially employed a similar hermeneutic. He “counseled nonretaliation” in his early years, but this changed due to excessive persecution in Mecca against his followers and the rise of his power in Medina. Muhammad now permitted his followers to defend themselves and even aggressively attack representatives of the persecuting power. Muhammad, at this time, was an advocate of self-defense. This is the difference between the Jesus and Muhammad stories. Jesus rejected the use of violence but Muhammad employed violence and “war-making in his administration of justice” (p. 45). Muhammad sought a just society and used force to secure it. Jesus sought a just society and used suffering love to secure it. Lee suggests that what developed in Islam after Muhammad was a classical tradition of war-making that is similar if not morally equivalent to the Just War tradition within historic Christendom. The “criteria and limits upon war…paralleled in many ways the Christian Just War tradition” (p. 59). Islam, like Christianity (using Greco-Roman resources), developed the need for a just cause, declared intent, a legitimate authority, and limits for how to conduct war. The formal logic, Camp contends, of historic (e.g., Constantinian and Augustinian) Christian and Islamic war-making criteria is essentially the same. But war is not always conducted on the basis of what are regarded as “just criteria.” Indeed, war-making in the European Christian tradition seems to arrogate to itself the right to transcend those criteria as needed. Whether it is the Crusades, or Puritan assaults on Native Americans in “New England,” or Sherman’s march to the sea, the Just War tradition failed to hinder unjust war-making. Lee recounts some of these stories; they are horrific. These ventures have at least one thing in common–violence against non-combatants or the redefinition of combatants so that it includes everyone living in the city (Jerusalem), village (Pequot), state (Georgia), or nation (Germany and Japan). As Lee states, the West likes the Just War tradition’s “formal logic–that war can be justified–but [it] does not like its constraints” (p. 95). These stories should be told in the West so that our national narratives might hear and take account of Western abuses of the Just War tradition. The logic that extends transcends the constraints of just war-making in some situations in the West is the same logic that is utilized by Muslim terrorists. “Total war” in Western practice (whether “Christian” or the Enlightenment politics of liberal Western democracies) is similar to a terrorist “holy war”–they both violate “just war” criteria, particularly the death of non-combatants (including women and children). “Moral equivalency” is the contention and is thus the justification articulated by terrorists (whether some Muslims or some right-wing American militia). The logic that burned crops in Georgia in order to make the South “beg for mercy,” that firebombed German and Japanese cities in order to subvert civilian morale, and that nuked Hiroshima and Nagasaki to force surrender is formally the same logic as Muslim or American (e.g., the Oklahoma City bombing) terrorism (p. 101). That is a chilling conclusion but one that Lee argues convincingly. At this point in the book, Lee “takes stock” (chapter 14) and it is important to hear him carefully. First, “the founding narratives of Christianity and Islam are different.” While Muhammad used the sword to end the conflicts on the Arabian peninsula, Jesus “employed the way of the cross to deal with” conflict (p. 105). Second, “the mainstream of Christian tradition looks more like the Muhammad story than the Jesus story” as it has rejected the basic narrative of peace-making in the Jesus narrative. He states this clearly: “I simply mean that the formal shape, the basic logic, of the church’s understanding of the employment of force on behalf of justice was more like the subsequent teaching of Muhammad than the teaching of Jesus” (p. 106). Do we believe the peace-making ethic of Jesus is realistic? Jesus lived it; he is our model. He is a peacemaker, and they killed him. That is realistic. When we advocate peace-making, it will upset some…especially when we advocate it on Veterans Day. But it is, as Lee argues and I believe, the ethic of the Sermon on the Mount, the ethic of Jesus.